Flu illness is widespread across the state and many health care facilities report full waiting rooms and a high demand for treatment of flu and other currently circulating illnesses. To help ease the crowding at medical facilities, state health officials want the public to know when and where to seek medical care, and to be on the lookout for warning signs of a potentially life-threatening situation. State health officials issue recommendations for when and where to get medical care. Unless they require immediate medical attention, people who have symptoms of flu should contact their doctor before going to a hospital emergency room. The emergency room should be used for people who are very sick. You should not go to the emergency room if you are only mildly ill. 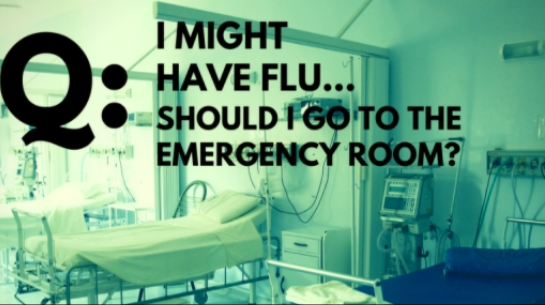 If you have the emergency warning signs of flu sickness (below), you should go to the emergency room. People who are at higher risk of flu complications should call their health care provider for advice if they get symptoms of the flu. People who have medical conditions, such as asthma and heart, lung, liver, or kidney diseases. A more complete list of conditions is on the CDC’s website. There are some danger/warning signs that should prompt immediate medical care. Get a flu shot. It’s recommended for everyone 6 months of age and older. Flu shots are available at most pharmacies and health care providers across the state. Washington provides all recommended vaccines, including flu vaccine, at no-cost for kids from birth through age 18. Fever or feeling feverish/chills - Not everyone with flu will have a fever. The Department of Health has a weekly report of influenza activity posted during the flu season. The department’s website is your source for a healthy dose of information. Also, find us on Facebook and follow us on Twitter.